Home » Articles » 3. You don’t just get a stomach ulcer; it takes effort! ← 2. Motion sickness, you could very well do without! 3. You don’t just get a stomach ulcer; it takes effort! Many people have stomach discomfort: stomachache, burping, acid reflux (= when food comes up), heartburn, a bloated feeling or nausea. These don’t have anything to do with an ulcer because you don’t just get an ulcer. Medical research showed that specific bacteria in the stomach lining are the cause of ulcers, the “helicobacter pylori bacteria”. This bacterium was successfully treated with antibiotics. Since almost everyone has had antibiotics at least once, this bacterium has already been “accidentally” treated in a lot of people and is no longer the primary cause of ulcers. The main cause of stomach ulcers seems to be the NSAID’s (medicines), which damage the protective layer of the stomach. There are two kinds of NSAID’s: anti-inflammation medicines (painkillers), like aspirin, ibuprofen, disclofenac, meloxicam, naproxen, estofenamaat, celcoxib, and blood thinners, like acetylsalicyl acid. The side effect of NSAID’s is that the protective layer of the stomach (stomach lining) thins, causing the stomach to be damaged by gastric acid. If this occurs over a long period of time, an ulcer develops, which will cause (stabbing) stomach pain. Especially if you need to use these medicines for longer than a week, NSAID’s appear to be harmful. Doctors usually prescribe medicines to protect your stomach lining, the so-called “gastric wall protectors”. Be sure to check if you need gastric wall protectors with your medication. The symptoms of an ulcer are: stomachache when your stomach is empty (at night). Gastric acid comes into the ulcer, causing pain. The pain is at the top of your stomach and reduces when you eat something or, for example, drink milk. People who have an ulcer can be eating or drinking constantly, also at night. Be sure to consult your doctor if you don’t trust it, even if it’s only to reassure yourself. Nobody gets healthier by worrying. Most people don’t use NSAID’s, which reduces the chances of developing an ulcer. Still, a lot of people suffer from stomach discomfort and pain. What needs to be reduced? When you have stomach pain, you have already been through a lot. Possibly you have a lot of stress, you smoke, drink alcohol or you continue to drink carbonated soft drinks. You are worsening the gastric pain by doing this, which isn’t in harmony with your body. Why do you continue to do this? It’s because of a deeper layer within yourself that isn’t being heard. What can you do with the MIR-Method when you have gastric pain? If you can’t stop smoking, drinking alcohol or soda, or if you can’t plan time for rest and relaxation, it becomes necessary to go further within yourself. You can do that by doing the MIR-Method. Most ulcers start because of the use of medicines. You can work on the source of your pain or inflammation with the MIR-Method for which you started using medicine in the first place. If you deal with the causes of your symptoms, there is a chance that you, in consultation with your doctor, can reduce your medication. You can consider the medicines as a temporary solution while, in the meantime, you work on the real answer to your pain and inflammation. What does the MIR-Method do? The trick is to go back to the real source of your pain and inflammation. Why did they originate? What happened in your life to cause this pain and develop inflammation? There could be many reasons for it, from traumas, heartbreak, abuse, accidents, and medical surgery to poisoning by food or drink, or, for example, through working in the chemical industry. Maybe you have a lot of pain, but doctors haven’t been able to find the cause. Then you can try the MIR-Method as well. Step 1 ‘Optimize acidity’ and step 2 ‘Detox all toxicity’. 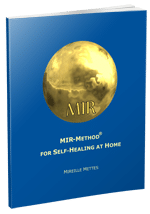 Step 1 and 2 of the MIR-Method work together to cleanse your body, because impurities that are trapped in your body can cause pain. It is very important to “cleanse” your emotional life: old emotions caused by your father or your mother, or through other men/women, sons/daughter in your life, can become trapped and cause you to feel hopeless, afraid, sad or angry. You can remove these emotions from your system by following the MIR-Method, and with that, create more space for yourself. The stomach meridian often plays a part with people who worry a lot (stress) and with people who have a bruised will. By clearing this meridian, you achieve greater inner peace through self-confidence and volition. Your stomach meridian is disturbed, for example, when you can’t taste all 5 different tastes: salt, sweet, sour, bitter and umami/spicy. Disturbances in chakra 3 can result in strong stomach discomfort, even pain. These disturbances can be caused by strong, negative emotions from your youth. For instance you were in an abusive family or you had to act like an adult at a young age which caused feelings of lethargy and victimization. You can heal your chakra 3 by stroking step 8, so that your volition and self-confidence can grow again. I highlighted some of the steps to explain how it works, but you always need to do all 9 steps in order for the MIR-Method to work. Do all 9 of them and do them in the order in which it was designed. Why do people drink alcohol, smoke, eat unhealthy and not rest enough? It’s because they’re not in touch with themselves and don’t love themselves enough anymore. You can restore the relationship with yourself by stroking your hand. By doing the 9 steps you can trigger your own self-healing ability and eventually recover your self-love. Do you smoke, drink, stress too much? Then there is a big possibility that you don’t see yourself as the #1 priority and you need to restore your relationship with yourself. Take good care of yourself. Don’t let gastric pain, medicines, pain or inflammation control your life, but address the causes. You are more than worth it! May you have a healthy, strong stomach! Do you relate to this? Have you already noticed that it works? Leave a message below! P.S. Please feel free to share this article with your friends. You can use the buttons below for Facebook, Twitter and email. Thank you! This may be silly but I think you’ve just saved my life. No more stress for me I need to think of myself first. Thank you for your information and positive post. Thank you! Yaaaaay, I am so happy for your insight: you first! Hope it helps you release all the stress! For the MIR-Method I use a different strategy. I do not like to be found through Google by people who are not looking for self healing. The way the MIR-Method spreads is by word of mouth. People send each other the name and the links. But thank you for wanting to help us here! Thank you for your kind words! I hope the MIR-Method brings you and your family good health! Can we do MIR method on mentally weak person. Can we do this on other like small children or a bed ridden patient. Can it be done surrogately for some one who is not present with us.Mam please reply. Thank you for your questions. Yes, you can use the method on mentally weak persons, but you have to ask permission from family and the people who take care of the person. There may be extra physical reactions that need to be dealt with, such as extra defaecation. You need to consider that first. Yes, you can safely use it on children. If the children has parents, it is recommended that the parents do it to, but only if they feel like doing it. Yes, you can use it on bed ridden patients, but here you also need to consider that extra care may be needed in the first weeks. For surrogate use, please read question 5 at the Questions page.